Texthelp are a leading assisted learning software brand with many different products, each of which had its own website. Texthelp wanted to consolidate their existing websites (17!) 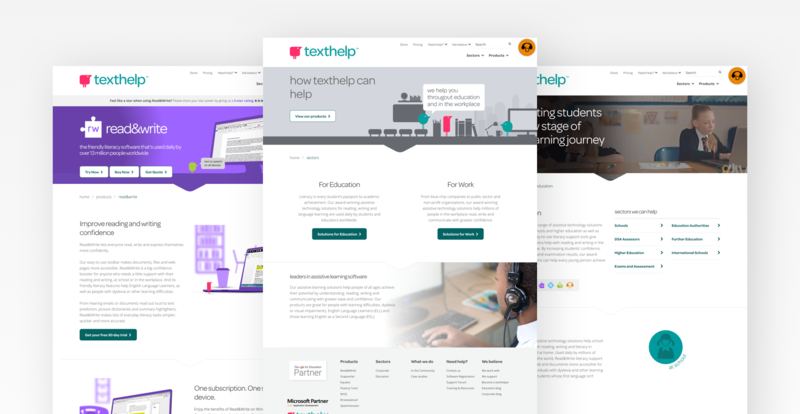 into one overarching site and raise awareness of the Texthelp brand as a whole. Firstly, I conducted an initial scoping session to discover and explore conflicting business and user requirements. I established their target audiences for each product and produced wireframes and high fidelity prototypes in order to show the client exactly how the site would work. Using Invisionapp, I produced and shared concepts with the client, ensuring that they were happy with the direction of the project at all times. Finally, I built a HTML pattern library to pass to the back end development team. One of the main challenges with the Texthelp project was the number of products that fall under the main Texthelp umbrella. I had to find a way of differentiating between these different brands, while building a cohesive site.